I already miss the cafes. I just returned from a trip to Paris and am yearning to just stroll down to a café to sit and observe life. 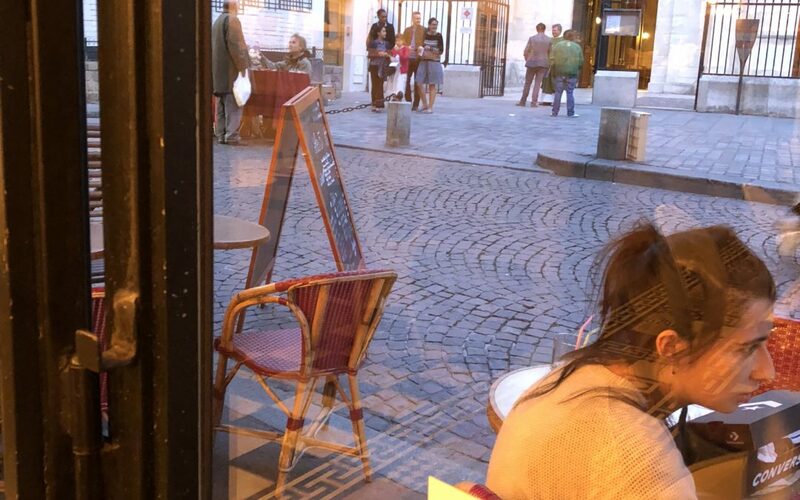 The French have taken people-watching to a new art form, with the cafes designed to look out at the street life, not hidden away inside where it is dark and noisy. Coming from a long line of “observers”, it is exactly my cup of tea. Or café crème actually. I adore going on vacation by myself, with no real agenda, to places where I can be a student of life. And most often, I realize that the more I observe other people, the more I see myself. Take for example, my observations one evening at dinner. I was seated at the window of a small establishment, directly across from a church. It happened to be the end of the church service and the priest came outside to greet the parishioners as they exited the building. Just on the other side of the fence was a homeless man, who was looking for a handout from the crowd. I watched to see if anyone would drop a few coins in his basket, but none were forthcoming. But what I was more curious to see was if the priest would come over and acknowledge him. I was filled with righteous indignation. I was ready to Instagram the whole thing, ranting on about the Catholic church and the hypocrisy of the church, the parishioners and the priest. Then I looked at myself. I wasn’t rushing over there to help out. And I realized that I could only see a part of the story. Maybe the church feeds this man or gives him a place to stay. Maybe he is there every day. He appeared mentally ill – maybe they have been advised not to engage him. There was so much I didn’t know and to jump to conclusions and to judge others based on my initial observations was just wrong. Before I did that, I’d need to observe some more. He returned – with a big smile on his face and money in his hand. He HAD dropped it! And I was reminded again not to judge. We get on the plane and the same man and his wife sit near me. They don’t like their seats so they get up and move to an empty row where they can stretch out. About an hour into the flight I am startled when I hear him YELLING at her. It’s in another language, so I can’t understand what he is saying, but really, he was yelling and she was cowering. I had to decide what to do. I watched, deciding that if he hit her I would yell for the crew. He didn’t and finally calmed down. I have no idea what he said or why he said it in such a way. I have no idea what or if she did something to provoke it. All I know is that my view of him had changed about 3 times in a few hours: from confused old man, to happy grateful guy, to angry belittling husband. He may be all three, and probably more. And if I had jumped to conclusions at any one point, I would have been wrong. There is a Chinese folk tale that talks about the twists and turns of life and how the best you can do is stay present, observe and remain curious. What seems true today may be only an illusion tomorrow. The only thing constant is my ability to learn and grow and make new choices every day in my life. And for that I am grateful. And also for Paris and sidewalk cafes.